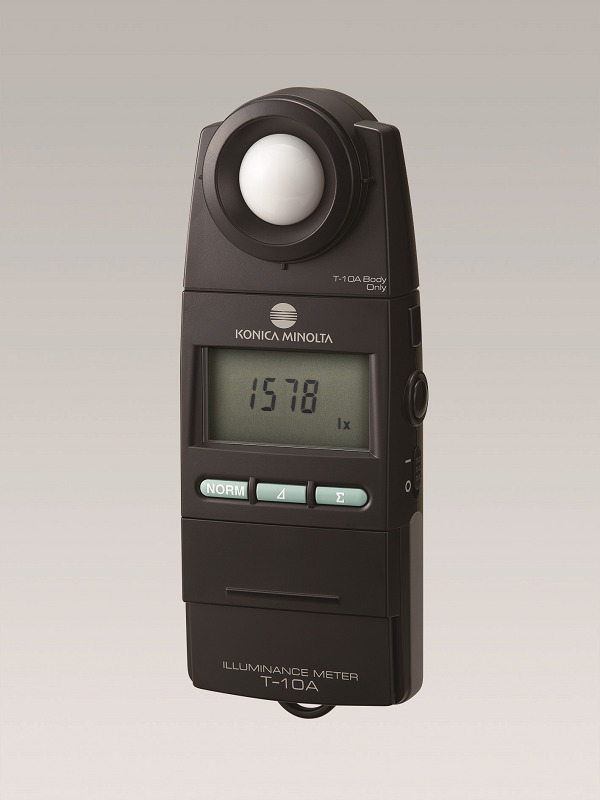 The Konica Minolta T10A is a high quality and precision illuminance (lux) meter. Lux meters are generally used for measuring light levels in buildings or structures to ensure they meet specified criteria. The Konica Minolta T10A has a range from 0.01 to 299,900 lux making it ideal for low light (emergency) right up to flood light levels. The standard meter comprises of the body and sensor head attached, to form a handheld instrument which is convenient and compact. With the option of 2 seperate adapters the sensor head can be seperated from the body and extended by means of standard length Cat 5 cables up to 99m. What is not generally known is that the T10A has a function called CCF (colour correction factor), allowing the unit to be calibrated against other light sources which may give inaccurate readings against the standard tungsten 2856 calibration factor. OTC are able to supply and calibrate the Konica Minolta T10A against a customers specific light source in our NEW enhanced calibration laboratory.